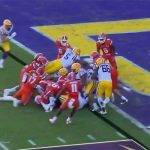 The Florida Gators took a 16-10 lead late in the fourth quarter of Saturday’s game against the LSU Tigers, but as Florida’s defense did all afternoon, LSU was able to drive down the field and get into scoring position once again with the final seconds ticking out on the game clock. 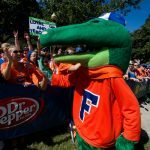 Facing a fourth-and-goal from the one-yard line, the Gators needed a stop to clinch the SEC East title for the second-straight season and advance to the SEC Championship Game. Florida not only got that stop — a third red zone turnover (fumble, dropped field goal, downs) — it demoralized LSU and put a ton of momentum behind the Gators with a play that will be remembered for quite some time.